Menopause Support is an all natural herbal supplement that is indicated for the relief of certain menopause related discomforts and symptoms. Some of these discomforts and symptoms include hot flashes and moodiness. Menopause is an important, unavoidable milestone in most women’s lives, so something that makes such claims as Menopause Support does is in need of some research. Soybean– Soybeans have been found in some studies to reduce amount of hot flashes caused by menopause. Black Cohosh– This ingredient can help relieve the symptoms of menopause. Wild Oat- Wild Oats can help with lowering cholesterol. The recommended dosage for Menopause Support is 1 to 3 capsules each day. The price of one bottle of Menopause Support is $16.02. For 4 bottles of Menopause Support, the cost is $62.48 and 12 for $182.63. If you buy 4 bottles, you save 40 cents, if you buy 12, you save 80 cents. Menopause Support comes with no known guarantee, whether stated or implied. 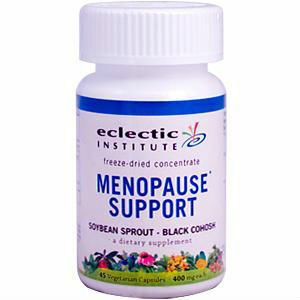 Menopause Support contains helpful ingredients that will surely improve the bodies health and function. However, none of these ingredients are actually proven to be effective or beneficial for the relief of menopausal discomforts and symptoms. It provides no guarantees as well, another mark against Menopause Support. Jackie Horowitz	reviewed Eclectic Institute	on December 8th	 and gave it a rating of 2.